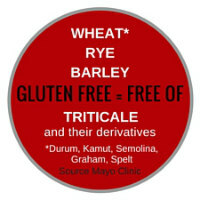 The Gluten Free Diet, Simplified! Whatever your reason for a gluten free diet, I'm here to tell you that it can be done, done simply and with your joie de vivre fully intact. I'll get to the secret of making a gluten free diet work (and making it healthy) in a moment, but rest assured if we can pull it off, anyone can. Asking a couple of food fanatics like us to go gluten free was pretty unthinkable. After all, when in New Orleans we would sample the local haunts for a breakfast of beignets and alligator sausage biscuits before full-on brunch at Commander's. Later we snacked on crab cakes and barbecue shrimp at Uglesich's before hailing a cab to Felix's for oysters (even the cabbie asked incredulously, "Didn't y'all just eat?"). These, just precursors before stumbling upon an unexpected vacancy for the kitchen table at Emeril's to feast upon a killer dinner, 6 courses, no less! Yes, we really love food, more specifically, we really enjoy food! Gluten Shmuten…What's It All About? It's about health. Adverse reactions to gluten run the gamut in severity and type from person to person. At a minimum, try omitting gluten from your diet and see how you feel. And no, it should not be dismissed as the latest food fad. There's science behind the reason why gluten is adversely affecting more people now than ever before. The Wall Street Journal article below succinctly sums up the reality of gluten intolerance and its rise. The other articles go into more depth, especially about a probable culprit: agricultural changes in our production of wheat and the health risks associated with gluten sensitivity. › WSJ - "Clues to Gluten Sensitivity"
› "Gluten: The Whole Story"
› "The Dark Side to 'Healthy' Wheat"
› "Three Hidden Ways Wheat Makes You Fat"
› "Why We Can and Must Focus on Preventing Alzheimer's"
Here's the simplest, healthiest advice I can share for a gluten free diet: stick with naturally gluten free foods. Build your diet around whole foods of (preferably organic and/or local) vegetables, nuts, seeds, fruits, pulses (beans, lentils, peas), fish, healthy oils and fats, + some meat and dairy products. And limit the gluten-free alternatives to gluten foods like breads, pastas, sauces, gravies, cereals, cakes, cookies, crackers and other baked goods to the occasional treat. That's the real boon of a gluten free diet. It should steer us towards eating and preparing more fresh, whole foods -- that naturally contain no gluten. And steer us away from the bulk of refined and processed foods that have boxed, canned, frozen and packaged their way into our daily diets and leave us decoding the lengthy ingredient lists in search of gluten. See this helpful shopping tip. This simplified gluten free diet also encourages more made from scratch cooking at home in lieu of too much dining out and grabbing food on the go -- money savers and quality time boosters to boot! It's really not a diet at all, but a better, fuller way of eating whole foods as nature intended and less factory-made, "food-like" products. That's the trick...accentuate the positives of this new lease on eating, cooking and enjoying good food and good health! For specific ideas and suggestions for putting this simple gluten free diet into action, continue on to our Gluten Free Diet Plan: The Whole Swap. And when you just got to have that occasional bread, cookie or other gluten food fix, give these recommended gluten free favorites and gluten free recipes a whirl.